A sneak preview of one of the pumpkins! He's hanging out in the fridge right now and will take center stage later tonight. I'm making some last minute decorations and (if they work out) I'll post my very first tutorial tomorrow. As I've already mentioned, I have weakness for maps. I make them into stationery sets, cards, stickers and anything else I can think of. I have a huge collection by now, but still can't pass them by if I find them at second hand bookstores or thrift stores. 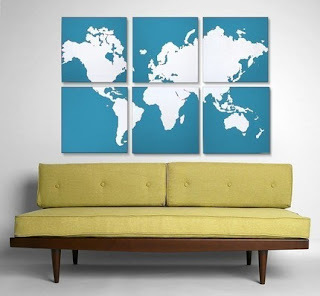 I've been thinking for a while I would love to frame a world map and hang it up in my home. I already found a really great vintage one, now I need to just find a large enough frame. I did come by this idea just recently. I love the idea how it's cut to pieces and they make a full map when hung together. Such a great idea. I don't think I'm ready chop up the huge vintage one I found, but maybe I could use this idea for another found map. I've been talking a lot about crafting and thrift stores and Etsy, but that's not all I'm about. (wow, sounds pretty... umm... revealing?) I do have another great passion (ok, there's more than one, but I'll get to those later). Something I get just as excited as I get about crafts and that I'll never get bored talking about. I love my "Loca's" by Brian Atwood. Also, to balance that out, I really dig sneakers. Go figure. Sundays are great crafting days. I always try to keep my Sundays free just for this purpose. A few weeks ago I took on the postcard project. I've been accumulating a pretty decent collection of LP records on my thrifting expeditions. Whenever I get a chance, I go through all the boxes of used records. It's actually pretty time consuming, so I only do this when I have time (a.k.a when I'm alone). I also feel kind of guilty when I do that, rummaging through the boxes with a bunch of (what I assume are) old school record enthusiasts... I go through the stacks and look for the awesome covers, not the music itself. For my defense, I always try to pick records with scratches and some that I noticed the store had several copies of. Once I have a decent pile of records, I sit down and start cutting them up (the covers, not the records) to be made into postcards. There's just something I really like about the graphics and the feel of those covers. I always think about where they might have been. Maybe played at some awesome parties or something like that. Even the text parts are amazing. I select the best parts of each cover and cut them in the same size. And then the stamping begins. I hand stamp everything on the other side of the card. Time flies when you're having fun. I think I spent about 5 hours on these and I still have some that I didn't finish stamping yet. I usually tend to take over the kitchen table for this project (the cards need space for drying). That has absolutely nothing to do with the fact that I get direct view to the TV at the same time. Nothing, I tell you! The McGill book fair was great! I found two vintage atlases with amazing maps, a Nature atlas with incredible illustrations and funky hand illustrated book about Canadian coins. Not sure what those will become yet. I'm sure I'll come up with something eventually. As I already mentioned (I think) I use a lot of second hand and vintage materials in my crafts. To get these materials, I do frequent several second hand shops. I try to support charity shops, just to get the double good feeling. First, finding great treasures and materials AND support a good cause. I've been making some really great finds recently on these trips. Last weekend I found the recipe box and a few books, this week it was the book fair. A few weeks ago, during the thanksgiving weekend I was visiting my in-laws and made a few stops to second hand stores around their neighborhood. I dropped by the Village des Valeurs (Value Village) and found some great treasures there too. Besides the more common haul of a few books and LP records I found an awesome scarf! It's a beautiful yellow Coach silk scarf. The condition is impeccable! You can still see the creases where it was originally folded, couldn't believe my luck. The pattern, logo and tags are all correct, so I'm confident I found the real deal. Couldn't be happier! We went today to look for some pumpkins. 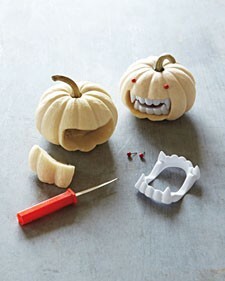 I wanted one or two big ones for carving and a couple of small ones so I can try out that awesome fanged pumpkin from the post from yesterday. There's quite a number of small, independently owned grocery stores around the area, so I try to support those whenever I get a chance. 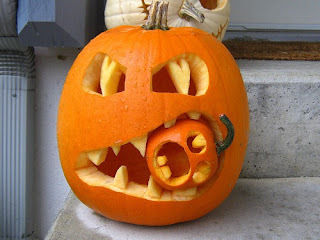 Anyhow, check out the pumpkins! I left them outside on the patio/balcony/whatever, I figured it's cool enough outside so they'll keep until next weekend. 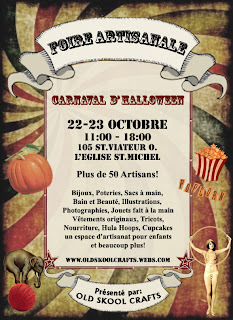 More Montreal craftiness this weekend at St. Michael's Church (105 St. Viateur, corner of St. Urbain). If you're in the neigborhood, drop by. Sounds like a fun way to spend a few hours on a Sunday (or Saturday). Open from 10am to 6pm or October 22nd and 23rd. Apparently there's a cupcake raffle! In all honesty though, I think the reason why I enjoy Halloween so much is that it's pretty new to me. It's a North American Holiday in the form we know it now. Even though it is apparently becoming bigger in Finland, it wasn't like that when I was a kid. Anyhow, as has become the tradition, we're hosting a Halloween party this year. (and by "we" I mean my husband and I, I'm not a crazy cat-lady who refers to herself and the cats as "we". 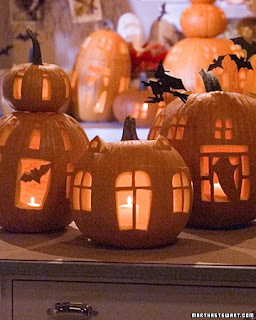 Just wanted to point that out) I don't do a lot of decorating, but usually insist on carving a pumpkin and getting a few decorations for our place. Pinterest has already proved it's worth. 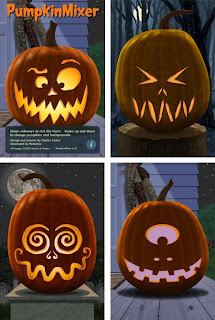 These pumpkins rock! I must try to make these. I'll post pictures once I have something to show! 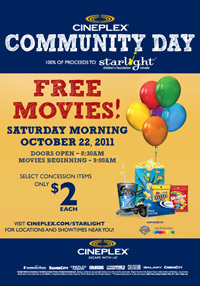 There's a charity event for Starlight Children's Foundation this upcoming Saturday, October 22nd. Free movies at the Cineplex movie theaters. The doors open at 8:30 AM and the movies start at 9AM. For example the Cinema Banque Scotia on St. Catherine's in Montreal is showing movies like "Harry Potter and the deathly hallows, part 1", "Green Lantern" and "Legend of the Guardians" all starting between 9AM and 9:40AM. The sale of certain concession items benefits the Starlight Children's foundation. Click on the picture or HERE for more details. If you're up for some movies and supporting a good cause, you should check it out! 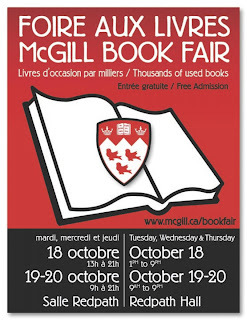 Maybe this is old news, but I just found out today that the annual McGill book fair started yesterday. If you haven't been there before, it's a wonderful opportunity to stock up on some good reads. This fair has been running since 1971. I'm definitely heading that way tomorrow. I love old books, so I'm hoping to find some great treasures. They do have more contemporary titles as well. Go take a look if you get a chance! This week I've been thinking about mail. The old fashioned kind, you know, involving stamps and the post office. I heard about the 52 weeks of mail challenge from a customer and then discussed snail mail in general with another... Old fashioned mail is awesome. Yet, somehow I don't send enough mail. Sending Etsy orders out don't count in this case, even though it's exciting every time. The 52 weeks of mail sounds like a wonderful idea, and even though I doubt I can participate to the full year's worth of mail, I want to take part in a smaller scale. Anyhow, I've decided to send out something in the mail at least this week. Something handwritten and for no particular reason. Thanks for the inspiration Pam! Yesterday I also took a walk to enjoy the day, didn't just sit inside all day making stuff. I ended up, as so often happens, to one of my local thrift stores. I go to the usual ones pretty often. I need materials and I always find so many things that inspire me too. This time I found a few books, including an awesome "The New World Encyclopedia of Cooking" from 1979. I'm not sure what I'll make out of it yet, but I figure it'll just hit me one day. I also found this really neat box. It's hard plastic, dark blue with a clear cover and has a picture of a knife and fork on the front. It's pretty odd to be honest, but I couldn't resist. I first thought it was meant to store cutlery, but it's way too small for it. I guess it's a recipe box. Well, whatever it was originally meant for it's now housing my finished stationary sets. It's a perfect size for it and more than anything, it keeps them safe from my over-eagar crafting assistants. That's the best, isn't it? Finding yourself with a free weekend when you weren't expecting it. I was supposed to work this weekend, but it was cancelled last minute and moved to the next one instead. So, now I have full two days to do whatever I want. Which is total awesomeness! Right now I'm chopping up some maps. I did mention I have a vast collection of them... I make stationary sets out of the maps, so there's always some cutting and assembling to do. I cut them all by hand too, so it takes a while. I don't mind though, I actually really like doing that. It's like a surprise for me too, to see how they turn out. As you can see, once I've cut, folded and glued them, I press them to make sure they won't get wonky. I use a heavy book to do that. I always use the same one, Diana Gabaldon's 'Drangonfly in Amber'. I found that a few years ago at a yard sale and had to buy it since it was in Finnish. (I'm originally from Finland) Now, I actually didn't read it for a long time and ended up using it to press envelopes and cards I make. FInally this summer I run out of stuff to read and this one was conveniently on my crafts desk. Man, am I ever glad I started reading it. I found out later, that it was the second book from the series. So, I clearly had to get the first one for my Kobo, and then the third one, and the fourth... I read all 7 books in a few months. Of course, I only found out once I was almost finished with the last one, that it wasn't, in fact, the last of the series... There will be one more at least... This always happens to me. I get into a series, read them all, only to find out that there's one more and it isn't even out yet. I should've learned by now. I find myself feeling extra inspired on Fridays. While on Mondays is tough to find inspiring things, Fridays are always full of them. It has to be the anticipation for the weekend that does that to me. I love everyday items that have something a little special about them. Even better if it's something I can do myself. A funky twist on a classic shape? Yes, please! Today's inspiration comes from Creatively Christy. 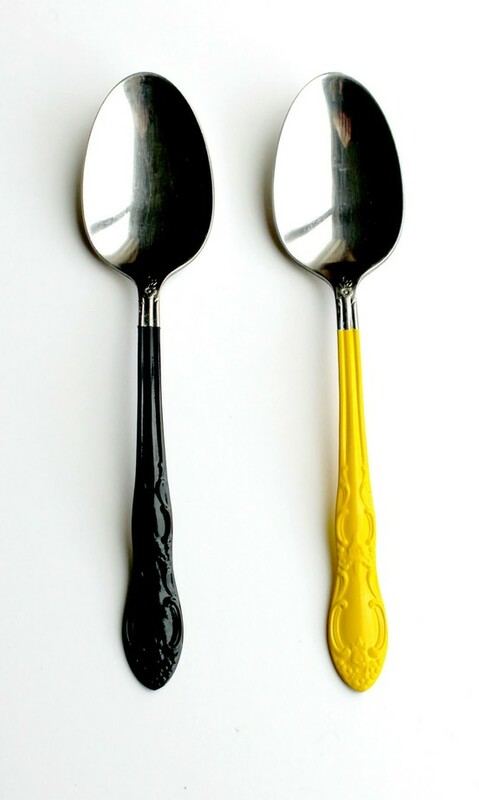 How amazing is this spoon transformation? I bet the morning cereal would taste so much better using one of these! I'm already thinking about the holidays. I'm THAT person who starts their holiday shopping from the post-Christmas sales in January and has usually bought all the presents by early November. Not because I'm super-organized or particularly efficient either, but because I find Christmas is the best crafting holiday. But I don't mean this in the orderliness, neatness, perfectly color-coordinated way. I mean this in the 'everything in the house is appropriately themed to match the holiday/season/occasion/whatever' kind of way. I do have a Christmas tree for sure. And a Gingerbread house. But that's about it. And my tree does not look like anything from Martha Stewart either. I't glitsy and kitchy and yes, there's an Elvis. A glitter Elvis no less! I got a bit side-tracked again, but I'm sure I'll post more about the tree closer to Christmas. The original point was the holidays. Best crafting time ever! What do you plan on making? And welcome to Hipster-Curious! My name is Catt and I'm a crafter. 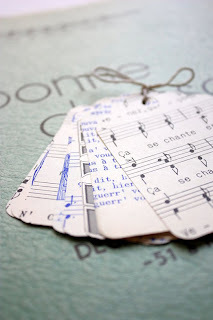 I collect old books, maps, used stamps and make something new and useful out of them. I've assembled a vast collection of discarded and un-loved objects I try to repurpose to a new use. To be fair, I don't limit myself to just upcycling, I like to try out all sorts of crafty projects. Anyhow, I'm very excited to get started. My head is full of ideas I need to get out and hopefully writing them down will help me keep organized.